Size of the group : Arctic Horizons provides only private guiding services, so the number of persons in the group for a given activity depends on the size of your group ! By group, I mean : family, friends, or you can even share the costs of a program with some people you just met during your time in Luosto (and with who you feel confortable) ! It is just that Arctic Horizons will not impose to you anybody you didn´t chose to be with ! General terms : Arctic horizons reserves the right to change the price, the content, or the duration of any of our program without prior notice. Adverse weather conditions in particular can bring instant modifications to the duration or the content of an activity. FITNESS : We are NOT an extreme sport company, our goal is to enjoy the arctic wilderness at a quiet, confortable pace. Therefore you don't need to be an athlete. You should anyway remember that some of our programs involve snowshoeing or skiing, sometimes in hilly terrain, and possibly in deep snow. 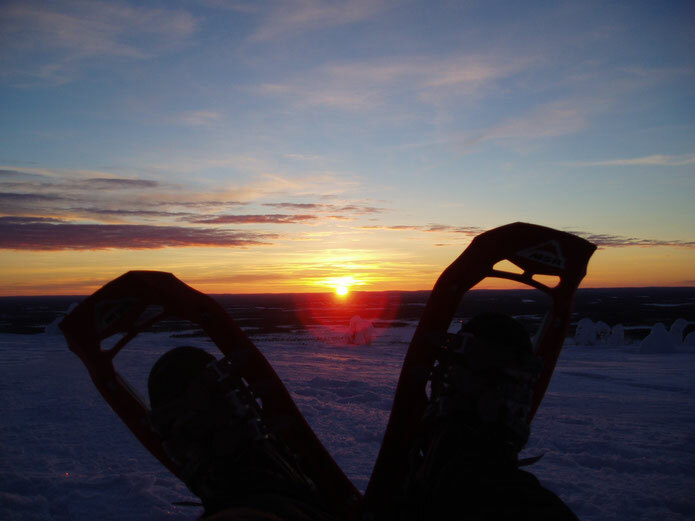 While snowshoeing is technically very easy (if you know how to walk, you know how to use snowshoes! ), as an average, 1 km snowshoeing (off track) corresponds to 1,5 to 2,5 km by foot, so if you opt for a full day 10 km snowshoeing trip, this corresponds to a 15-25 km walking trip, and you can expect from 5 to 6 hours of walk (without counting the breaks). Let me know beforehand if you have some physical issues or limitations ( heart problems, asthma, joints...). -First rule is to put enough clothes to the children (usually we meet at your hotel/cabin, so we will check this together before we hit the trail). Always take some spare/extra children clothes with you (extra gloves, hat, fleece...). A very warm hat is compulsory, as young children will lose up to 40% of their body warmth from the head!! -If temperatures drop under -15C, I will always adapt our active programs (snowshoeing/skiing) depending on the temperature and the age of the children, so that we are not going too far away from the civilization. I will regularly ask the children if they are cold : If they tell they are, we turn back and go back immediately to Luosto... safety first. for less active programs (ice fishing, reindeer farm visit...) we are always close from a fire, but also from transport, so there is no problem. -I will not organize full day snowshoeing/skiing trip for families with children under 14 years old.